On the second anniversary of the flooding of southern Louisiana and Mississippi, the problems of reconstruction are so broad and complicated that it’s difficult to say anything new. On one hand, certain homeowners with good insurance and responsive government, especially on the Mississippi coast, appear to be rebuilding fairly well. On the other, in New Orleans, where much of the city marinated in floodwaters for days, the stories remain those of “red tape,” which are extraordinarily disheartening. Very few new homes have been rebuilt in poorer areas that were not served well by private insurance; full coverage by the Times-Picayune news system is here. I’m skeptical of any simple “solution” for the rebuilding of New Orleans. But I would have liked to have seen the appointment of a federal Katrina Restoration “czar” (to revive an overworked but useful term), who would have listened to various constituencies but been empowered to make decisive and definitive decisions for the federal government, at the risk of annoying state and local authorities. It is, after all, mostly federal money that is rebuilding the levees and being funneled to Louisiana for the “Road Home.” For one thing, I would have liked the painful decision made to abandon to new residential construction some of the lowest-lying and most vulnerable sections of New Orleans. But an autocratic federal rule would have run into great opposition from distrustful state and local authorities, which, of course, are traditionally responsible for land use policy. Complicated rules about doling out reconstruction money -– much of which has gone to businesses –- have slowed down reconstruction, especially in housing for the poor. I am among those who are always skeptical of much government intervention in markets, but perhaps it would have been more straightforward to have much of the federal money go directly to a one-time rebuilding of inexpensive housing. The controversial practice of “mountaintop removal” coal mining might become more common under a regulation expected to be issued tomorrow, in proposed form, by the Interior Department’s Office of Surface Mining Reclamation and Enforcement. (Here’s a Summary of the Environmental Impact Statement.) This form of mining involves the blasting away the top of a mountain to get at the valuable minerals. The spoil from the mining then typically is dumped in nearby valleys It is this fill –- which sometimes buries streams and affects water systems for miles downstream –- that causes the most environmental damage. Like many regulatory matters, the story has a complicated history. The planned regulation would clarify an existing rule called the Stream Buffer Zone Rule that limits mining immediately adjacent to streams but allows some filling in with spoil. Public opposition to such land-disturbing practices might be ameliorated, in light of the recent deaths and publicity from shaft mining, which is riskier for miners but less intrusive to the environment. Mining operators say that they need to be able to fill in valleys with spoil to make mountaintop mining feasible; advocates asserts that the economies of states such as West Virginia need to continue the practice to stay competitive. Do legal, policy, and planning efforts to improve a city’s friendliness lead to a city’s greater popularity? This enjoyable essay on walking in New York City suggests that efforts to decrease street crime, clean up the streets, and make New York a more enjoyable place have increased the habit of walking in the city –- a practice that was all but lost in America in the 20th century. While Minnesota debates whether to rebuild the highway bridge over the Mississippi with public transportation routes, advocates in Aspen, Col., are trying to avoid widening the current main road route into the resort city. Does it mater, for legal purposes, whether the leading motivation is to encourage public transit (the ostensibly good purpose) or simply to keep outsiders out (a less savory motivation)? The pressures of environmental policy continue to transform land use and law. Will coal-mining increase or decrease as an American land use in next few decades? Pressures to cut back on carbon-spewing coal push in one direction, while uncertainties of foreign oil supplies push in the other. The latest spate of sensationalized coal-mining accidents might result in even tougher safety laws, which would raise the cost of mining in America and work against the coal-mining industry. A fascinating parallel story of coal's rise and fall is playing out in the Ruhr district of Germany, which my 1960 Encyclopedia Britannica refers to as one of the world's largest coal-mining regions and the "largest single industrial area in the world." Times have changed. As a result of the recent decision of the German government to phase out extensive subsidies of the now minor coal-mining businesses, analysts expect that coal mining in the Ruhr will all but cease by 2018. Mining will stop not because there is no more coal in the ground -- there is -- but because it is cheaper to import coal than it is to pay German workers and comply with tough German safety and environmental laws. Land that used to be scarred by coalmines is turning into forests, hops farms, and new housing developments. Will the same happen to American mining areas of Kentucky and Wyoming in the near future? The issue of immigration, both legal and illegal, may soon become the dominant topic of the domestic political debate. While the national government has failed to take a new course, many local governments are trying to impose new restrictions -- or harassments, if you prefer -- on immigrants. What is most interesting to me is that many advocates of tougher local laws point to the impetus of -- no, not of crime, the figures for which don't necessarily point to immigrants in many places -- but, rather, land use problems. The "overcrowding" of houses and driveways and the putatively uncouth home-life habits of uneducated young men living together are spurring the new crackdowns, supporters say. Here and here are some examples. What does it take to open up a music hall? Once upon a time, a new commercial business opened by private initiative. But in many places in our more sophisticated age, a commercial venture necessitates a partnership between the business and government land use authorities, with troubling consequences. Consider this anecdote from my old hometown, Silver Spring. Md., where the county government has been active in channeling money into the "redevelopment" of the once-"declining" old suburban downtown. The big news last year was that the semi-famous mid-sized music hall, "The Birchmere," of Alexandria, Va., was planning to open a second hall in Silver Spring, in a long-disused department store. As a devotee of the alt-country, bluegrass, and blues music that the Birchmere presents, as I was thrilled that the business had chosen my old hometown for its second music venue. How naïve I was. In places such as the rigidly controlled downtown Silver Spring, businesses don't decide to open commercial ventures; rather, businesses propose ventures to the government, which then decides whether to fund such a venture, or whether another type of business would be better for the government's vision for the economic development of the area. In the case of the Birchmere, the original plan was that the county and state governments would pony up more than half of the multi-million cost of opening the music hall. (Who knew that it costs so much to take an old store, paint the interiors black, bring in a few chairs, and string up a sound system? Not me, apparently.) But the new reports are that the county government then decided that it wanted a much larger hall that could accommodate 2000 patrons, instead of the 700 or so that the Birchmere planned. The county government dreams, of course, of thousands of music-goers spending money in downtown Silver Spring each night. (Imagine 2000 patrons! Will Silver Spring become the new Times Square?) So the Birchmere "deal" (it really wasn't a business plan at all, but a joint venture between government and business) appears to be dead. Here another subtext that I'd be willing to bet played some role. When government chooses which unique business to subsidize, it does so at the risk of annoying those businesses -- and customers -- that it doesn't subsidize. Paying for the Birchmere to open in Silver Spring would have pleased fans of alt-country, bluegrass, and blues -- who are predominantly middle-aged white folks (like me). The music hall wouldn't have been as popular, I can be sure, with people who didn't fit this demographic; as many downtown Silver Spring patrons are African American as are white (and a growing number are Latino and Asian immigrants). If I were a local politician, I wouldn't want to be in the position of trying to explain why I used taxpayer money to subsidize the musical tastes of alt-country-listening white professors. It's a tangled web that local governments create when they steer and control business through land use planning. In fact, I can think of no other aspect of our society in which the "S" word seems so alive and kicking. While socialistic governmental policies are in retreat elsewhere in the world, many local governments are increasingly eager to have themselves, not just business, decide the sociology and economics of which businesses will be established. The music fan in me may be unhappy because of the loss of a chance to hear the blues, but the land use law critic in me fears even greater problems. What to do about the housing slump? Economists say that that the housing slump is now imperiling the entire American economy. Although government can't do much more to improving the housing market, what should government do to soften the impact of the housing slump upon American citizens and businesses? Forgive me if I don't have too much sympathy for those who bought into what can now confidentially be called the "housing bubble" of about 1995-2005, now that it has "burst." Yes, I feel for home buyers who were fooled by adjustable rate mortgages, balloons, and other nontraditional mortgages that are now costing them more than they expected. But I don't have much sympathy for buyers who simply took on a loan that was more expensive than they could afford, simply because a lender was willing to make them the loan. And I have even less sympathy for lenders who made risky loans, and investors who bought risky securitized mortgage loans - both in violation of good business practices. Bad lending and bad investing practices should be punished by the market, in large part so that businesses in the future may learn from the mistakes. The hoary stereotype of a “suburb” as a uniform, conformist area of mostly white and affluent homeowners needs to be put to rest. In a nation in which most Americans are suburbanites, the makeup of today’s suburbs varies tremendously. 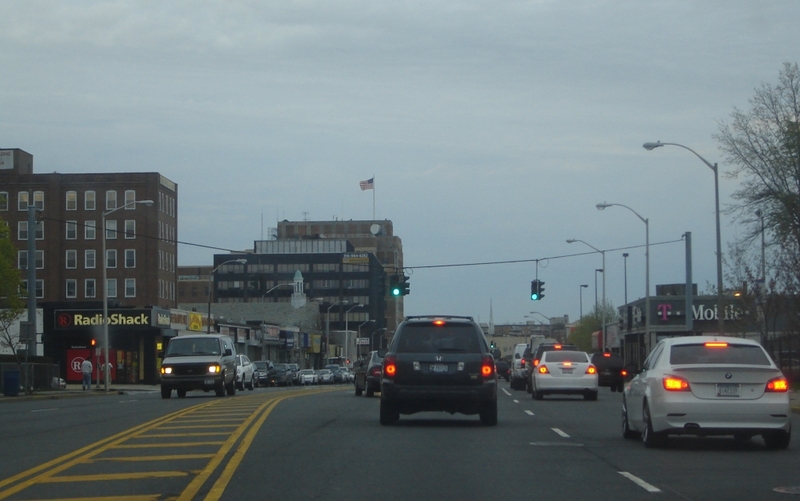 One famous old suburb –- Hempstead, N.Y –- is trying to revive its prospects. At one time, Hempstead was a prosperous business and rail center of Long Island, one of the nation’s first 20th century bedroom “suburban” areas. But in the same pattern as in many central cities during the past century, Hempstead has largely been passed by economically in recent decades; its population has also grown more black and Latino. In many senses, Hempstead has more in common with struggling central cites of the east, or with the outer boroughs of New York City, than it does with affluent suburbs further out.